The day has finally come when you will add a new member to your family — not a little brother or sister, but a dog. But before that first meeting happens, it’s important to prep everyone with instructions on how to help your new puppy or adult dog fit in. The key is making sure everyone is ready to help with training from the beginning. Hero’s homecoming has likely got your kiddos whipped into a frenzy on par with Christmas Eve. But from a dog’s perspective, a child’s well-intentioned hugs and smothering attention may be off-putting, even frightening. “I ask kids to think of a time when an adult, say a distant uncle that they didn’t know well came right up and hugged them,” explains Joel Silverman, veteran trainer and author of “What Color is Your Dog?” (Kennel Club Books/BowTie Press, 2009). “It can be uncomfortable, and it’s the same way for your dog.” Instead, teach kids to let the dog approach him. Then avoid the temptation to bear hug, squeeze or chase him. Try gently stroking your dog’s back or chest instead. Educating your four-legged friend is a must for everyone’s sanity, dog included. You’ve got three options. “Obedience schools can be great for socializing puppies, but the distracting environment may mean your pup makes slower progress,” says Victoria Stilwell, dog trainer and host of Animal Planet’s “It’s Me or the Dog.” Nervous or shy dogs may be better suited for one-on-one training with you or a hired trainer, though you have to consider the cost of enlisting a pro. If you’re a DIY type, there’s a wealth of information on dog training in books and online, but be sure to consider the time investment you’ll need to learn proper techniques and work with your dog regularly. Consistent messages can be a challenge when everyone’s got a hand in training, but different rules and schedules only confuse your dog. You’ll set your pet up for success when it’s understood by all that the couch is off limits or that your pup must always sit before you hand over the kibble. Most experts recommend providing a crate with soft cushion or blanket and toy in a quiet place, like the parent’s bedroom, for puppies and young dogs. “Dogs are den animals, so they feel safe in enclosed spaces,” explains Silverman. Note: don’t close the bedroom door, which may make them feel isolated and anxious. 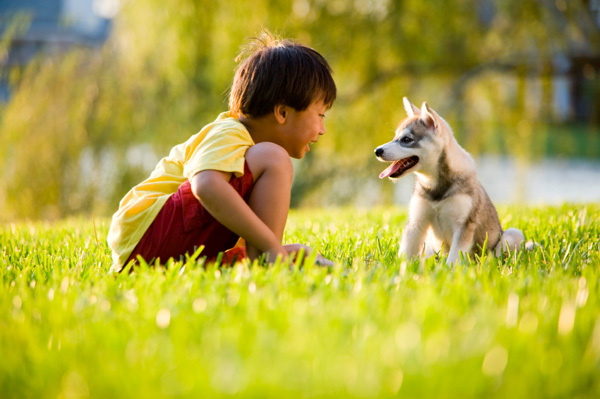 Just like a parent’s job is never done, training a dog is an ongoing process. “Dogs continue to learn as adults, and training needs to be reinforced at every age,” adds Stilwell. By the same token, those years of sweet companionship are well worth a thousand of sit-and-stays.